Flat tummy water is a great natural drink to help you lose belly fat and assist with weight loss in general. Water infusion recipes to help get a flatter tummy are also delicious and pleasurable to drink. What’s more, drinking water infused with ingredients like cucumber, ginger, mint, and lemon effectively flush toxins from your body and help you lose fat around your belly at the same time. Of course, any healthy weight loss program should also include regular exercise, watching portion size, and reducing your calorie intake. However, if you want to lose weight in general, increasing your consumption of weight loss water will help you lose weight quicker. In this article I am going to look at scientific-based research on the benefits of drinking water infusions to help lose weight. You will also discover great flat tummy water recipes that are easy to make at home and taste delicious. First, let’s look at what exactly is flat tummy water. Flat tummy water is a term given to infused water drinks to help improve your health, detox your system, and help you lose weight. Incorporating these weight-loss drinks into your diet will help you lose weight in general and reduce the size of your belly. The journal Fitoterapia published a study on the effect of cucumber on ridding the body of free radicals. The study found that cucumber helps to remove waste and toxins from the body. 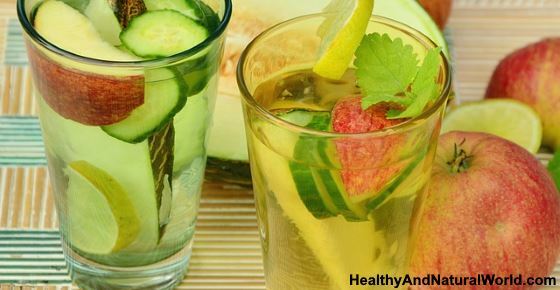 It also boosts the digestive system and has great therapeutic potential.3 Later in the article you’ll find a recipe of detox water for weight loss containing cucumber and other healthy ingredients. You can make your own flavored weight loss water very easily at home. Because these infused drinks are much tastier than regular water, you usually drink more of them than just plain water. All you need is a good source of clean water, a large glass container, and plenty of delicious herbs, fruits, and vegetable to create your delicious detox drink. In general, the water and ingredients are stored in the glass container overnight in the refrigerator to infuse and will last for up to 2 days. You can drink the ginger detox weight loss drink hot or cold to help give your body and metabolism a boost. Put the strawberries, lemon slices, and mint leaves into a pitcher and fill will ice-cool water. Leave in the refrigerator overnight to infuse. The sweet strawberries will help counteract the tartness of the lemons and mint helps boost the weight-loss properties of this infusion. 1 cucumber, peeled and sliced. Consuming honey in moderation is a great addition to many weight-loss flavored water drinks because it gives natural sweetness and energy without adding unhealthy calories. Just remember that honey adds extra calories to the weight loss drink, so don’t exaggerate with the consumption of honey to keep calories under control. Add 1/2 teaspoon cinnamon to a cup of hot water and stir well. The best type of cinnamon to use is Ceylon Cinnamon. When the liquid has cooled, add a teaspoon of raw, organic honey. Take the cinnamon drink before meals to help reduce your food cravings to help you lose weight faster. Alternatively, you can add 2 sticks of cinnamon and one thinly sliced apple to a pitcher of water and allow to infuse overnight. Pour into a glass, add a teaspoon of honey and drink to get the health benefits from this chilled weight loss detox water. The easiest way to boost your weight-loss program with apple cider vinegar is to drink apple cider vinegar diluted in water daily. You should mix 1-2 tablespoons apple cider vinegar to a glass of water and drink first thing in the morning. If the taste is too acidic, you can add some raw honey as a natural sweetener. The combination of apple cider vinegar and honey has many health benefits. To make the flat tummy drink, make the green tea by letting 2 tea bags infuse in an 8-oz. cup of boiling water. Keep covered for 10 minutes and remove the tea bags. When the green tea has cooled, add the apple cider vinegar, lemon juice, and natural sweetener to taste. Stirr well and enjoy this drink hot or cold to boost your metabolism. Mix all the ingredients in a large glass of water and drink before meals. The lemon in the flat tummy water drink helps to flush toxins and give you a boost of vitamin C. The honey improves your energy levels and cayenne pepper gets your metabolism working better. Drink one cup of flavored water first thing in the morning to give their metabolism a boost. Consume one glass of infused water for weight loss 20-30 minutes before a meal to reduce appetite cravings. Many people wonder when they start drinking flavored water for weight loss what they can expect from it. The weight loss you can expect to see from these detox infusions will happen gradually and you should be patient. Also, consuming flat tummy water drinks will be most effective for you when used in conjunction with a healthy exercise program, reducing calorie intake and maintaining a healthy diet. You must avoid these 8 foods to keep belly fat away, processed foods, and don’t indulge in fast food. You should also avoid these 10 fake foods and also make sure that your food doesn’t contain these ingredients. Get moving! If you do some moderate exercise, five times a week, you’ll be helping your metabolism and increase your metabolic rate. For more information read my article on how much walking you need to lose weight. Eat foods rich in potassium. This mineral reduces your stress levels and lowers blood pressure. Good sources are bananas, sweet potatoes, avocados and spinach. Reduce your sugar intake, especially refined sugars – there are effective ways to help you quit sugar. If you want to lose belly fat fast, you also need to avoid certain food groups and specific foods as well. It is also important to learn how to cook delicious meals that can specifically help you lose belly fat. You can even accelerate your fat loss by doing certain types of exercises. Unfortunately I cannot cover all this information in one article but you can find all this information in my e-book Blast Your Belly Fat. Nutr Rev. 2010 Aug; 68(8): 439–458. MedlinePlus. Fluid and electrolyte balance. Eur Rev Med Pharmacol Sci. 2013 Jan;17(1):75-83. J Am Coll Nutr. 1997 Oct;16(5):423-8. J Clin Biochem Nutr. 43, 201–209, November 2008. Evid Based Complement Alternat Med. 2014; 2014: 642942. J Agric Food Chem. 2009 Jul 8;57(13):5982-6. WebMD. Cayenne pepper may burn calories, curb appetite. J Med Food. 2006 Spring;9(1):49-54.